Gamers who shell out $19.99 for Arkham Origins' Season Pass will be treated to two exclusive skins. Batman: Arkham Origins is less than a month from its release date, which naturally means it's time to talk about DLC. Warner Bros. announced the Arkham Origins Season Pass today, a $19.99 bundle that will grant access to $30 worth of downloadable content. There are five DLC packs in all, one of which contains two skins exclusive to the Season Pass. The fancy Season Pass-only skins are Gotham by Gaslight Batman and Brightest Day Batman, though they're just the tip of the superhero costume iceberg. There's also the New Millennium Skins Pack and Infinite Earth Skins Pack, both of which have a few new outfits so that our fashion-forward Dark Knight can stay on trend. If you're more concerned about gameplay than costumes, the Season Pass will grant you some of that, too. "Arkham Origins Initiation" puts you in a pre-Batman Bruce Wayne's shoes, where he'll train in an unspecified number of new challenge maps. There's also one pack that relates to the story campaign, though no details about it were provided in the press release. 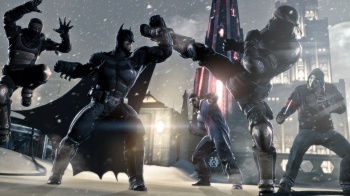 Arkham Origins will be out for the Xbox 360, PlayStation 3, Wii U, and PC on October 25.